What can I say, things are moving forward in the wait station. The floor had dried long enough to make it walkable, nevertheless we put building paper down to protect it from the dust and dirt we carry around on our boots (and paws). After installing cove molding along the north and east wall it was time to bring in some furniture. Right after we had bought Gunk Haus we had renovated the cottage (remember the cottage?) and put in all new kitchen cabinets, which we then removed again when we took the cottage down to make space for a new septic field. 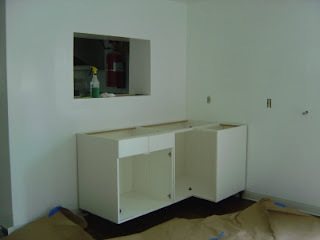 These cabinets are now filling the wait station.